Movies Like The Hangover (2009) '+g+"
The Hangover is a 2009 American comedy film centered around three groomsmen who travel to Las Vegas for a bachelor party where they lose their about to be wed buddy during their drunken misadventures, having no memory of the previous night's events they must retrace their steps in order to find him before the wedding can take place. 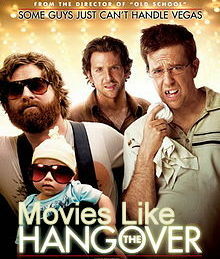 If you like watching more movies like The Hangover and The Hangover Part II then find the recommendations for it below. Dude, Where's My Car? is a 2000 American comedy film directed by Danny Leiner. The story is about two slackers who find themselves wasted with no memory of the day before. The duo has to retrace their steps to discover just where they left the car. Harold & Kumar Go to White Castle (2004),...if you can think of more, then don't forget to mention it in comments.